Above The trellis screening, bench and deck are pri- marily made of weather-resistant ipe wood. Boston Ivy and English Ivy cover the screening. The floor consists of thin granite pavers on a rigid black backing. 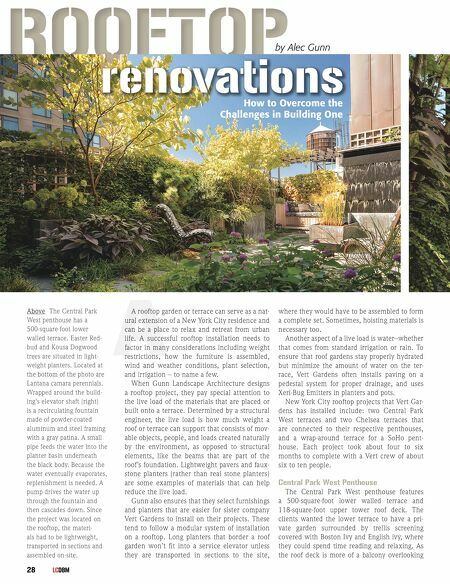 June 2018 29 Central Park, simpler furnishings and grasses were installed to focus on the pleasant views from above. One of the biggest challenges on this project was transporting up all the materials in a nar - row service elevator, and this had to be factored into all aspects of the project. The screening, built-in seating, and decks had to be construct - ed on the lower terrace. The clients wanted a water feature that would wrap around the elevator shaft, so Gunn designed a cascading fountain. The fountain was transported through the service elevator in sections and installed as a complete unit on-site. One of the other key challenges of this proj - ect was keeping the live load to under 40 pounds per square foot for this pre-war residen - tial building. 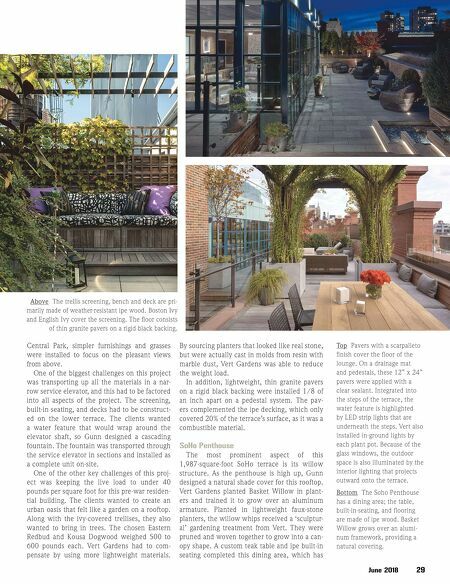 The clients wanted to create an urban oasis that felt like a garden on a rooftop. Along with the ivy-covered trellises, they also wanted to bring in trees. The chosen Eastern Redbud and Kousa Dogwood weighed 500 to 600 pounds each. Vert Gardens had to com - pensate by using more lightweight materials. By sourcing planters that looked like real stone, but were actually cast in molds from resin with marble dust, Vert Gardens was able to reduce the weight load. In addition, lightweight, thin granite pavers on a rigid black backing were installed 1/8 of an inch apart on a pedestal system. The pav - ers complemented the ipe decking, which only covered 20% of the terrace's surface, as it was a combustible material. SoHo Penthouse The most prominent aspect of this 1,987-square-foot SoHo terrace is its willow structure. As the penthouse is high up, Gunn designed a natural shade cover for this rooftop. Vert Gardens planted Basket Willow in plant - ers and trained it to grow over an aluminum armature. Planted in lightweight faux-stone planters, the willow whips received a 'sculptur - al' gardening treatment from Vert. They were pruned and woven together to grow into a can - opy shape. A custom teak table and ipe built-in seating completed this dining area, which has Bottom The Soho Penthouse has a dining area; the table, built-in-seating, and flooring are made of ipe wood. Basket Willow grows over an alumi- num framework, providing a natural covering. Top Pavers with a scarpalleto finish cover the floor of the lounge. On a drainage mat and pedestals, these 12" x 24" pavers were applied with a clear sealant. Integrated into the steps of the terrace, the water feature is highlighted by LED strip lights that are underneath the steps. Vert also installed in-ground lights by each plant pot. Because of the glass windows, the outdoor space is also illuminated by the interior lighting that projects outward onto the terrace.